This serene print pairs a gentle whale shark with a curious swimmer and iconic constellations. Adrienne Vita creates an ethereal, connected world in this enchanting print. 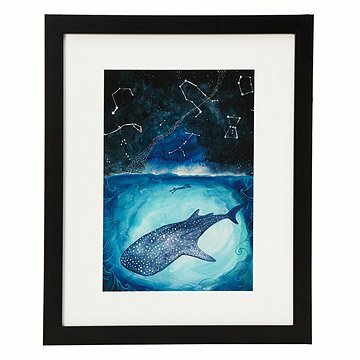 Showcasing a gentle whale shark, curious swimmer, and iconic constellations, this piece brings to mind a calm night by the ocean as it celebrates the relationships between the stars, humans, and animals of the sea. Designed, printed, and framed in Portland, Oregon. We have this piece of art hanging in our master bathroom to add a feeling of tranquility there. We ordered it as a Christmas present for our mom. Didn't unpack it. Christmas Day when the presents were open it appeared that it was framed upside down... It's an expensive print and, maybe it was my fault for reading wrong, but I swear I thought it's was supposed to be the original... Anyways presents are done and we are not in a situation to take it back and send but it's a disappointment since we were waiting for this present for awhile.